Arbor Day is a date set aside to promote and encourage the planting and care of trees of every variety and type. History tells us that the first celebration was held on April 10, 1872 in Nebraska. It was a result of the efforts of J. Sterling Morton, who was a journalist and newspaper editor. He was a Nebraska pioneer from Detroit who had particular interest in trees. In fact, he was a well-know advocate of tree planting. Later in the 1870's, other states joined in and made it an "official" holiday. 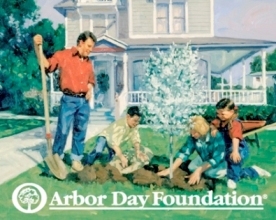 Today, the USA National Arbor Day is held on the last Friday in April. Some states adjust the date, however, to better suit their geographic location and weather. Southern states' optimal tree planting timeframe may be weeks earlier than that of northern states. Other countries also participate, but may also adjust the date for similar reasons. No matter the date it is celebrated, this holiday is meant to help increase the number and quality of trees on our planet. So get involved, holiday or not, and plant a tree, maybe a pecan. For more information visit www.arborday.org/arborday/.